The “towering theme” of Hebrews is the Eternal Priesthood of Jesus Christ which is mighty and active for us sojourners on earth. That this priesthood of Jesus in Heaven operates through sacramental grace here on earth can be seen from the sacramental imagery utilized in Hebrews. Jesus’ priesthood is thus intrinsically linked to the power of the sacraments. Right at the beginning of Hebrews we are confronted with a powerful sacramental image – that of Jesus in Heaven being anointed for his “royal-priestly” ministry. The verse at Hebrews 1:9 states:“God has anointed you [Jesus] with the oil of gladness beyond your comrades.” This sacramental-like anointing of Jesus as Eternal-Priest King is at the root and foundation of the anointing of priests for service in Jesus’ Church, and for the sacrament of anointing the sick. The only time in scripture Jesus is referred to as an “apostle” is at Hebrews 3:1. And what did the apostles do when Jesus sent them out on their first missionary journey: they anointed the sick (see Mark 6:12-13). The Sacrament of Confirmation is specifically alluded to at 6:2 with reference to the “laying on of hands,”which not only “confers the Spirit” but is also indicative of priestly ordination. At 6:4 there is reference to those who have “tasted the heavenly gift,” which is most likely a reference to the Eucharist. Moreover, in Hebrews the priestly “Order of Melchizedek” is mentioned five times in reference to Christ’s Eternal Priesthood. And what did the priest-king Melchizedek offer to God in sacrifice: bread and wine (see Genesis 14:18). The Eucharist is greatly prefigured by the sacrificial offering of Melchizedek. There are further references to the Eucharist in Hebrews, such as the one found at 13:10 where it states, “We have an altar from which those who serve the tent have no right to eat.” Moreover, the Eternal Priesthood of Jesus demands attendance at the Sunday liturgical celebration which is not to be “neglected” (10:25), otherwise, Jesus’ sacrifice (made present in the Eucharistic liturgy) is rendered fruitless, “and there no longer remains a sacrifice for sin” (10:26). Indeed, through sacramental worship we on earth come into the “celestial liturgy of Heaven” (see Hebrews 12:22-24; “You have come to Mount Zion and to the city of the living God….”). Although there is no specific reference to the Sacrament of Confession in Hebrews, the congregation is admonished to “obey” and “submit” to its pastors who “keep watch” over “their souls” (13:17). The great High Priest Jesus, in a powerful Resurrection appearance, gave these same pastors the priestly function of forgiving sins (see John 20:22-23). In short, while the Epistle to the Hebrews demonstrates the powerlessness of the Old Testament Levitical and Temple priesthood, it concurrently demonstrates the sacramental power of Jesus’ Eternal priesthood in Heaven. 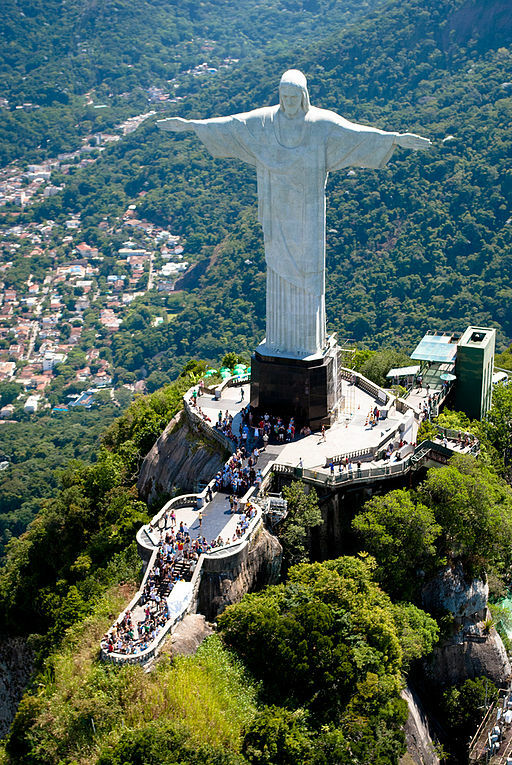 Photo Attribution: Aerial view of the Statue of Christ the Redeemer in Rio de Janeiro, by Gustavo Facci (posted by Flickr). This file is licensed under the Creative Commons Attribution-Share Alike 2.0 Generic license. The photo was taken on Ferruary 18, 2011. This information at Wikipedia.